What Causes Them and Can I Get Rid of Them? In order to understand what is involved in the permanent removal of lawn mushrooms, it is important to know where they come from, and what causes them. Lawn mushrooms are simply the product of fungi infested in you yard soil in one or more areas of your yard. They are actually the fruit of this fungus, and feed off different sources that could be present. Abundance of food sources for the fungi in your yard soil will pretty much ensure the presence of lawn mushrooms in your yard. The more food sources for the fungi, the bigger the lawn mushrooms will grow. That is the reason sometimes the lawn mushrooms will be very large, and sometimes they will be very small. It all depends on the amount of food sources the fungi has available. Permanently ridding your yard of lawn mushrooms means totally eliminating the food sources for the fungi. While this can be difficult, and sometimes impossible, the following paragraphs will provide some insight on what is involved in permanently ridding your yard of lawn mushrooms. Most people spend a lot of time trying to rid their yard of lawn mushrooms. Removing them as you see them is one method of removal, but it will be a never-ending task during several months of the year. Continual removal will keep the appearance of your yard up to par, but the source of the lawn mushrooms will still be present. Thus, the lawn mushrooms are likely to return in the future. 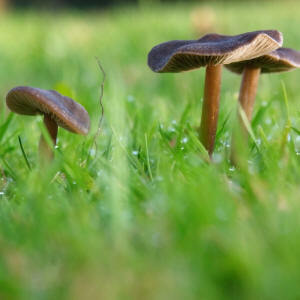 Chemical removal is another method home owners use to rid their yards of lawn mushrooms. As with continual removal, the chemicals will normally kill the mushrooms that are present. But with the food sources for the fungi still present in your yard soil, the lawn mushrooms are likely to return. Some homeowners research to find a more permanent end to their lawn mushroom problem. There is only one way to permanently rid your yard of lawn mushrooms, and that is to exhaust all of the food sources in your yard and soil. Having old tree stumps ground may aid in the permanent ridding of lawn mushrooms, but it could also cause a type of mushroom called fairy rings to appear. Most lawn mushrooms do not harm your lawn, but fairy rings are known to commonly kill grass in certain areas of your lawn. The only effective way of permanent removal of lawn mushrooms of any kind is to rid the fungi of its food source. Sometimes, even after an old tree stump has been removed, the fairy rings and lawn mushrooms come back. In this case, the soil containing the fungi had to be removed, as well. When the food sources for the fungi have all been exhausted, and any soil infested with the mold spores has been removed, you should cease to see the presence of lawn mushrooms in your yard.